Coming soon -- a new observatory! Construction is moving forward at our future facility in a great dark-sky location! Work on the two buildings is now almost complete. See below for photos! Above is an artist rendition created by Jordan Spuck of the new observatory planned for construction. 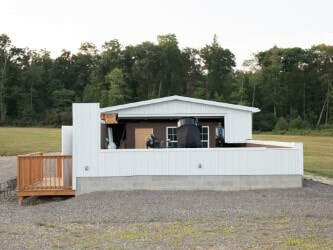 The new facility will be located at an improved dark-sky site in southeastern Venango County, centered between Franklin, Oil City, and Clarion . The address will be 4249 Camp Coffman Rd., Cranberry, PA 16319 (see the maps and coordinates below). Providing sufficient funding can be raised, the new facility will include the observatory housing a 30-inch telescope, on-site restrooms, and a separate classroom facility to accommodate student and adult groups for school field trips, community presentations, and other activities. We are currently seeking support in the form of labor, materials, and funding for the new facility and its operation. YOU or your business can play an important role! We have a growing list of contributors to the project, and we'd love to have your name on our "Wall of Stars" when the project is complete. ORAS has been fortunate to receive many significant contributions to our building project. Below is a list of those who have donated money, stock, and in-kind contributions as of June 21, 2016. In the coming months, we hope to move quickly toward completion of the project. 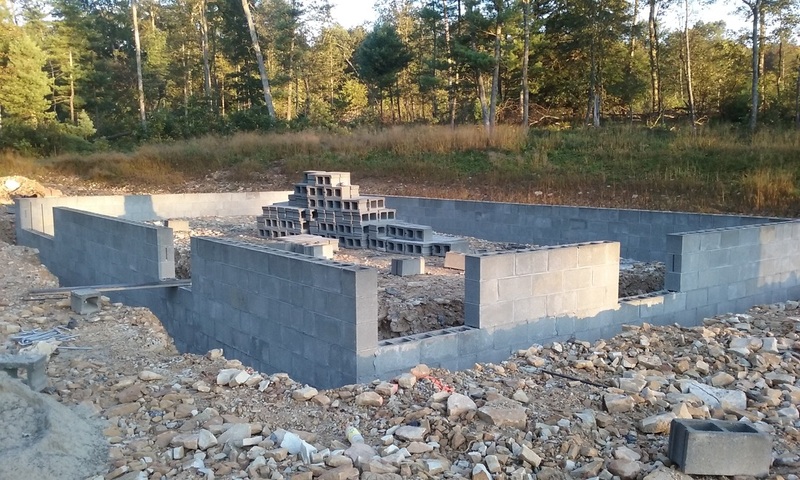 We look forward to opening the facility for learners of all ages to come and enjoy the beauty of the night sky, one of the major natural resources and assets of the Venango, Clarion, and Forest County region. Please consider making a contribution today, by clicking on the "donate" button above, or by sending a check made out to ORAS to our mailing address, P. O. Box 1535, Oil City, PA 16301. If you are interested in helping out by contributing labor, resources, or other assets to the project, please contact Tim Spuck at tspuck@hotmail.com or 814-354-6515. ORAS is a 501c3 non-profit organization, and all contributions are tax deductible. Unless otherwise requested, all contributors will be recognized on the permanent "Wall of Stars" at the new facility. The Wall of Stars will be similar to the HR diagram image located at http://uofgts.com/Astro/starclass/HRdiag-Big.jpg. Each star will be named after a contributor, and the individuals and businesses making the largest contributions will of course be recognized with the largest stars. In memory of Dave Kiser, Sr.
Click on the button at the top of the page, and help make the new observatory a reality! will be 41.321903 N and -79.585394 W.
Starting from the intersection with Route 257, near the Cranberry Mall, follow Rte. 322 for about 8.7 miles after you pass Route 257. At the corner of Route 338, shortly after Hirsch's Meats, turn left onto Camp Coffman Road. At one point this road makes a sharp turn to the left. About 3 miles from Rte. 322, the road appears to end in a T. Turn right on the continuation of Camp Coffman Road, and follow it for about 1 more mile, passing the entrance to Camp Coffman on the right. The entrance to the observatory site will be about .3 miles further, on the left. From the post office on Route 208 in Shippenville, follow Rte. 322 for 6.4 miles. At the corner of Route 338, turn right onto Camp Coffman Road. At one point this road makes a sharp turn to the left. About 3 miles from Rte. 322, the road appears to end in a T. Turn right on the continuation of Camp Coffman Road, and follow it for about 1 more miles passing the entrance to Camp Coffman on the right. The entrance to the observatory site will be about .3 miles further, on the left. Take Exit 45 from Route 80 onto Route 478. Turn left, go under Route 80, and then turn right onto Route 38 after about .2 miles. Follow Route 38 for about 10 miles, until it intersects with Route 322. Go right on Route 322 for 3.5 miles. At the corner of Route 338, shortly after Hirsch's Meats, turn left onto Camp Coffman Road. At one point this road makes a sharp turn to the left. About 3 miles from Rte. 322, the road appears to end in a T. Turn right on the continuation of Camp Coffman Road, and follow it for about 1 more mile, passing the entrance to Camp Coffman on the right. The entrance to the observatory site will be about .3 miles further, on the left. Take Exit 53 from Route 80. Turn left onto State Route 3007, and go about .7 mile to Route 338. Go right on Route 338, continuing straight through the town of Knox. Route 338 will end at Route 322, about 8.3 miles from Route 80. Keep going straight at this intersection. The road will now be called Camp Coffman Road. At one point it makes a sharp turn to the left. About 3 miles after Rte. 322, the road appears to end in a T. Turn right on the continuation of Camp Coffman Road, and follow it for about 1 more mile, passing the entrance to Camp Coffman on the right. The entrance to the observatory site will be about .3 miles further, on the left. There are no large or well-marked roads leading directly to the site from the north. If coming from Oil City, take Route 257 south until you reach Route 322, and then follow the directions above for "from the west." If coming from Fryburg, take Route 208 south to Shippenville, and then follow the directions above for "from the east." Bird's eye view of the observatory site, August 2016. Multipurpose building at the far left. Photo courtesy of Steve Behringer. Delivery of the track for the roll-off roof. Getting ready to unload the pieces of track. Butch Kopp moving a piece of track. Exterior track pieces in position on the piers. Interior portion of the roof track, with Dave Jones. Exterior part of the roof track, viewed from inside the observatory. Observatory with roll-off roof in the open position.